Meditation is a key component of Buddhist practice, tied to the Right Mindfulness and Right Concentration components of the Noble Eightfold Path. Meditation is also essential for developing Right Understanding - a direct, rather than purely intellectual, knowledge of the Four Noble Truths. Tranquility or Concentration Meditation (Samatha Bhavana) - In this form of meditation, you begin by concentrating on one object of focus, attempting to slow, and eventually quiet, your mind. The most common form of this meditation is focusing on your breath - the sensations associated with your breath moving in and out of your body. Many Buddhist schools use some form of breath meditation as beginning meditation practice, before teaching other forms. In some schools, breath meditation is the only form of meditation taught, and different levels of practice, or dhyanas, are described, progressing from the beginning stages of forced concentration up to a state of pure immersion in equanimity, as the mind stills and relaxes into pure being or awareness. Breath meditation is also often taught for stress management purposes, outside of a Buddhist context. There are dozens (if not hundreds) of other forms of concentration meditation taught in various Buddhist schools. In the fifth-century Theravadin text the Visuddhimagga, over 40 different objects of focus are described, and the text suggests which types are best for each individual based on certain personality traits. Tibetan Buddhist schools incorporate external objects of focus such as mandalas and mantras, some of which are described later in this article. 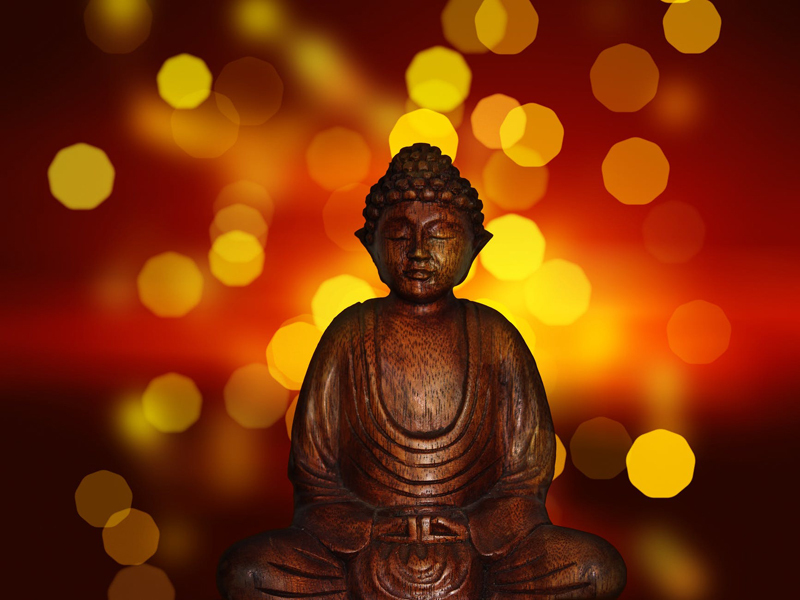 Insight meditation (Vipassana Bhavana) - Sometimes called mindfulness meditation, these forms of meditation are not just about stilling the mind, but about observing it. Although instructions differ by school, the general idea is to note sensations, emotions and thoughts as they arise, but to let them pass through your mind without attaching to them. The goal is to experience direct knowledge of impermanence (anicca). Both moving and sitting forms of Insight meditation are taught. Lovingkindness meditation (Metta Bhavana) - Also sometimes called compassion meditation, these forms of meditation are sometimes classified as Concentration forms, because they initially involve focusing on sending feelings of compassion or love towards other people and beings. This is usually done in a progressive fashion, starting with directing these thoughts towards yourself, then towards family and friends, and eventually to all beings. This form of meditation is prevalent in Mahayana Buddhist traditions. Although most meditation forms can be categorized as one of these three, some techniques cross over, and many Buddhist schools teach more than one, or combine them. Some schools require that novices perform preliminary practices, and develop knowledge of fundamental Buddhist principles, prior to learning to meditate, while others do not. Buddhism is usually taught in a teacher-student relationship, so most Buddhist teaching centers have classes specifically on meditation. Although anyone can begin meditating on their own, especially with simple concentration forms such as breath meditation, as a student progresses a teacher's guidance is often helpful in helping to sort through the various distraction that can arise. Zazen - This is the Zen term for meditation, and zazen is central to Zen practice, because Zen emphasizes direct realization or satori. There are variations on how zazen is taught, but the two main forms are koan meditation, associated with Rinzai Zen schools, and 'whole-hearted sitting' or shikantaza, associated with Soto Zen schools. In koan meditation, a practitioner contemplates a seemingly non-sensical statement or story given to them by their teacher, in order to experience a level of awareness beyond rational or linear knowledge. Shikantaza practice is similar to Insight meditation, with a practitioner attempting to observe and settle into a level of awareness untouched by surface activity and categorizations. One unique mark of zazen in some schools of both branches of Zen is that the eyes are kept open during practice. Mantra Meditation - Mantras are sacred sounds and words repeated in a chant-like fashion. This form of meditation is common in Tibetan Buddhist schools, but other schools also incorporate it. A common Buddhist mantra is 'Om Mani Padme Hum', which cannot be literally translated, but is associated with the Buddha of Compassion, Chenrezig. Here's an article on more Buddhist mantras. Mandala or Yantra Meditation - Mandalas and yantras are both forms of religious art that employ sacred geometry to create representations of Buddhas and the states of realization they are associated with. By meditating on them through gentle gazing, a practitioner can merge with this awareness and directly experience these states him- or herself. Here's an article on Buddhist mandalas. Guru or Deity Meditation - Also most frequently found in Vajrayana Buddhist schools, guru or deity meditation involves initially visualizing a Buddha or teacher external to oneself, and then imagining oneself as that Buddha or teacher. Like mandala meditation, the purpose of this is to experience the enlightened mind of this teacher or being directly for oneself, through the highest state of meditative dyhana. Note that this article is included in my e-book Introduction to Buddhism and Buddhist Meditation.